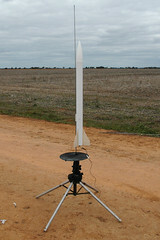 The Orbital Decay had it's 1st test flight this week with a new fin design. Stability issues now fixed! Final tweaks on the kit and it should be ready to ship early in July. The first run will be 10 kits, but looking for a larger run on the 2nd batch.